One of the things I want to do more of while we live in this house is sharing the little things with you guys. I used to be really good about that, but somewhere along the line I started to feel like the little projects weren’t “worthy” of a full blog post, and I started to only post about the bigger projects, or when things were more complete. But, I love reading blog posts about smaller, less “impressive” projects, and I know I can’t be the only one. I shared this little gallery wall on Instagram the other day and got lots of questions about the sources of various things in the shot, so I figured a full blog post would be helpful – plus, this is currently the most finished room in our house, and I’ll take any excuse I can to snap a few photos. In this house, I’ve been trying to be very intentional with the art we put on the walls. I’ve always kind of just put whatever was laying around on the walls without putting a ton of thought into it. 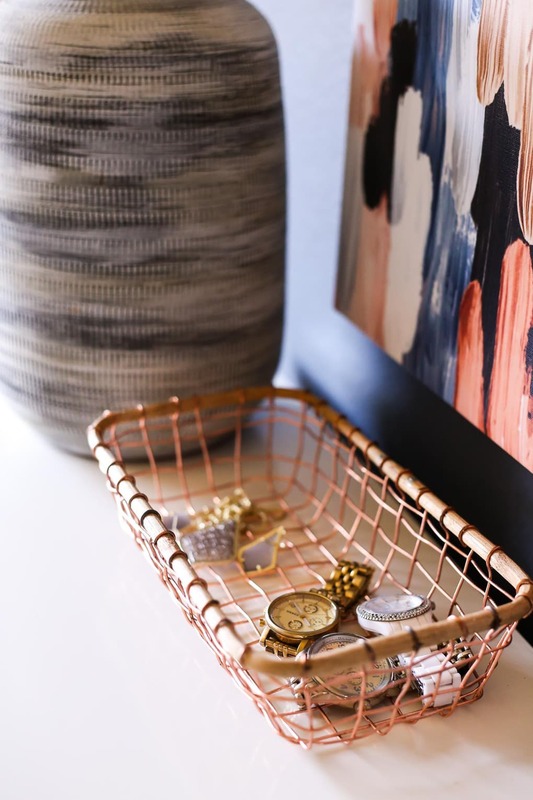 I’ve had a few pieces that I really enjoy (like my DIY geometric wood art, which is currently hanging in our living room), but overall I’ve never really felt anything about the art in our home. I want that to change this time around, and so I’m taking my time with putting things up and putting more thought into it as I go. I still have a couple of spots in this room that I’d like to hang something (once we replace the nightstands, I think the wall where our bed is could use another piece or two), but this little nook looks pretty perfect to me for now. The large piece is something that we picked out for the master bedroom in our old house. It’s actually designed by one of my friends from high school, Lisa Guen Raymond, and I love it so dearly (you can find it here). It’s one of the first pieces of art I ever had that just makes me smile every time I see it, and it couldn’t be more perfect for this room. 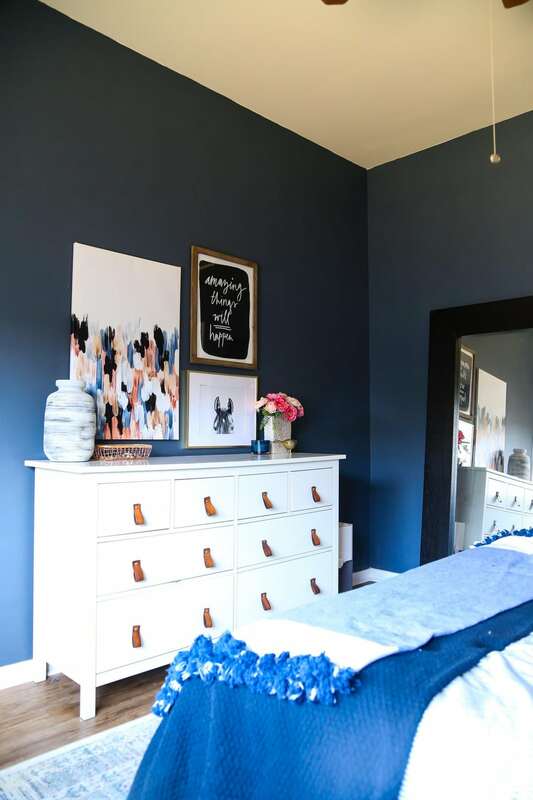 The colors are exactly what we’re going for, and it adds a feminine touch that this room has been needing. 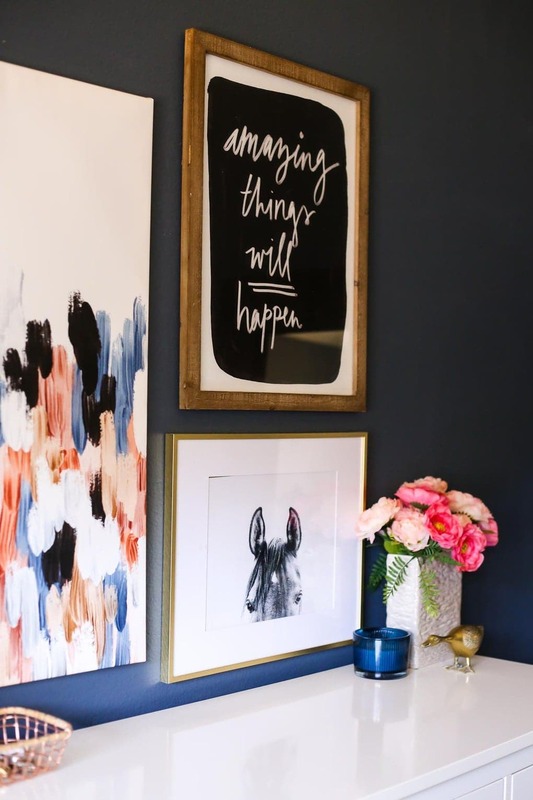 The “Amazing Things Will Happen” print is one I snagged on clearance at Hobby Lobby for my office nook in the old house (you can find something similar here). I’m a big motivational quotes person, and having this be the first thing I see when I wake up each morning is a great way to start my day. Plus, I love that it brings out the black in the abstract canvas – it makes me happy when things work out like that. 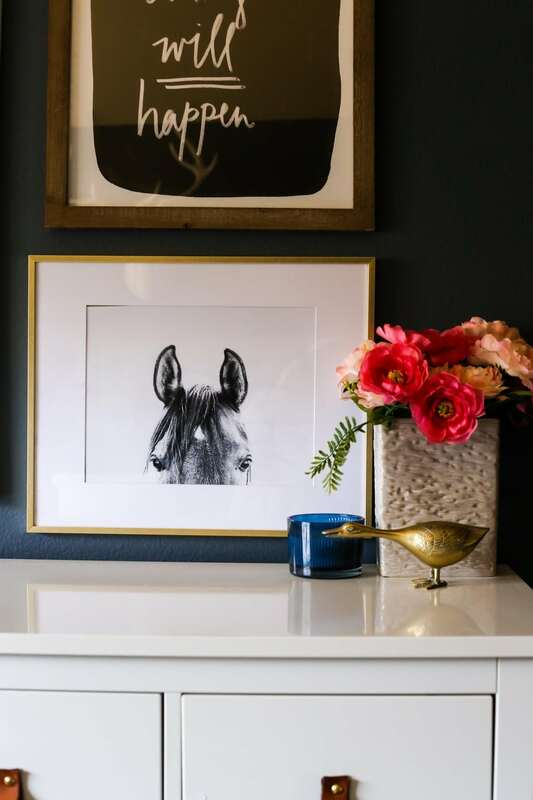 Finally, the horse print is the one thing we bought specifically for this space. 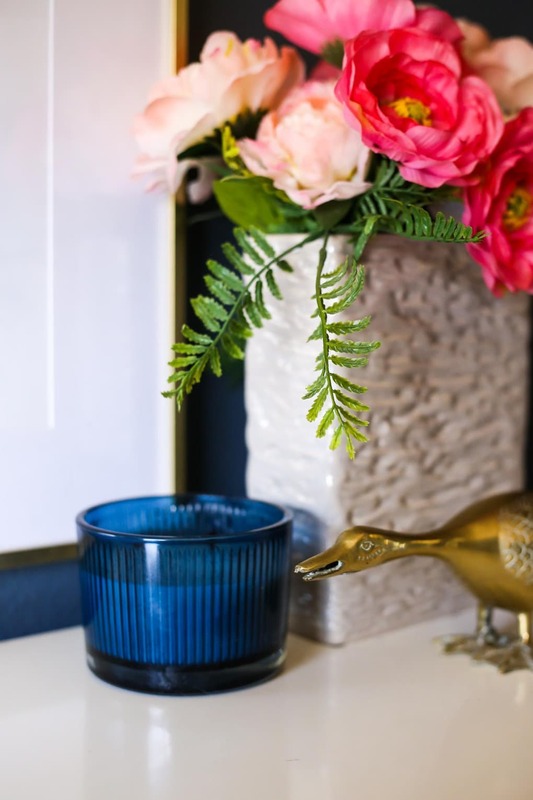 I wanted to use this gold frame from Target (we used to have it in Jackson’s bathroom) because it played well with the other frame and helped bring some more of a feminine feel into the space, but I didn’t have anything for it that would work well. 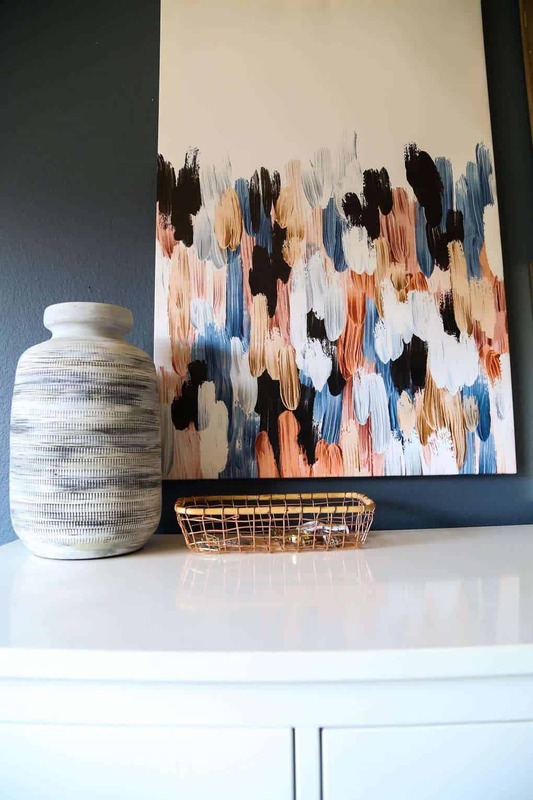 I did some browsing on Etsy and Minted, and I decided pretty quickly that I wanted a black and white animal print because I’ve been drawn to them every time I’ve seen them on Pinterest or Instagram lately – I’m not sure what it is about an artsy black and white farm animal that speaks to my soul, but they just make me so happy. I also really liked this one, this one, and this one. I’ll link everything in the photos below (or I’ll link similar items if I can’t track down the originals), along with some other similar options – and, since it’s probably the most-frequently-asked question since we moved into this house, I’ll add that the paint color is Calligraphy by Behr and it’s probably my favorite color I’ve ever painted a room. Oh, and you can find the tutorial for the leather drawer pulls right here! We still have a lot to do in our bedroom, but I feel like it’s at least at a point where we can come in here and completely relax, without constantly thinking about all of the things on our to do list. And that, my friends, is a good feeling. I think the next thing I’d like to tackle is figuring out what we want to do with the window treatments in here. I think we’ll do floor-length curtains, but the window sits up pretty high off the ground, so that might not be the best option (also, I may just be spoiled from our almost-floor-to-ceiling windows throughout the entire last house). We’ll see – you know I’ll keep you updated.